AOG has combined forces with Dr. Ben Van Mooy (WHOI) to co-develop our PHORCYS incubation system. PHORCYS: PHOtosynthesis, Respiration, and Carbon balance Yielding System. Basically, an incubation system for the ocean that leverages, in unique ways, recent advances in sensor and sediment trap technology. 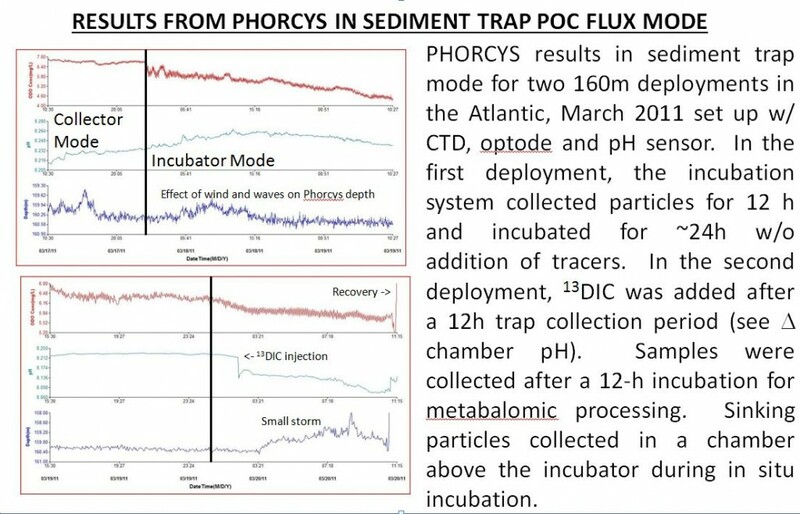 PHORCYS can be deployed in the euphotic zone to estimate primary production and respiration, or it can be deployed in deeper waters in order to meaure in situ repiration rates. PHORCYS is an expandable and versatile ocean observing platform composed of incubation chambers and a unique combination of sample collection systems and sensors that can be used to measure photosynthesis and respiration in aquatic and marine systems under in situ conditions. The instrument, in various configurations, makes use of the standard approach of tracking dissolved species involved in photosynthesis and respiration (oxygen, nitrate, carbon dioxide, pH, etc) over time during an incubation. All PHORCYS instrument configurations share four basic elements: 1) a optically clear and/or opaque incubation container that collects seawater; 2) systems to open and close the incubation containers, thereby initiating and terminating the incubations; 3) oxygen, nitrate, carbon dioxide or pH sensors, and/or varients thereof; and 4) a electronics unit, which provides power and records data. Other embodiments of PHORCYS instruments include devices to add solutions and/or take water samples during the course of incubation, and automated valves for opening, rinsing and closing the incubation chambers. 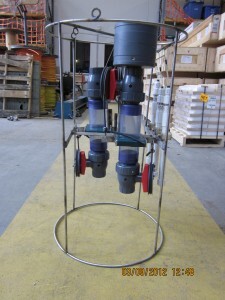 Current embodiments depend on external rigging to position the PHORCYS instrument in the appropriate location of the water column and proper orientation to collect and incubate samples under in situ conditions. Future systems will be self-ballasting and self-orienting.